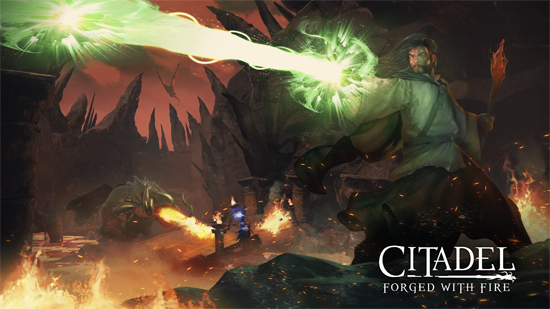 Citadel: Forged With Fire, has released its first major expansion pack called, Forsaken Crypts. Available for download now and free to anyone who owns the game, the new expansion pack adds a huge amount of endgame content, and players can now face off against three massive bosses in three different citadels. Each area will feature specially themed armor and tons of brutal creatures to do battle with! Prepare to explore the lava-laden Dragon's Heart Citadel or search for the Pyrant Armor as you battle your way through the frozen Dragon's Heart Citadel. Your choice of adventure awaits in the Forsaken Crypts expansion pack, so jump into Citadel: Forged With Fire on Steam now! Phoenix Spirit Citadel: Players will travel through the remains of a once pristine white marble palace that has been ravaged by the passage of time. Uncommonly large and powerful Sprites have littered the tepid environment with massive statues and mystic inclinations, any wizard brave enough to enter their domain should expect to be met with extreme resistance. Dragon’s Heart Citadel: A once beautiful city, filled with meticulous architecture was destroyed by a volcanic disturbance sometime between the end of the reign of Wizards Kings and your arrival to Ignus. Dragon’s Heart Citadel and the surrounding mountain vistas are now replaced by valleys of bubbling lava, jagged stones, and a host of migrant dragons drawn to the region’s endlessly simmering heat. Blood Soul Citadel: A rustic fortress that once had a stable, temperate climate is now forbiddingly frigid and encased in jagged ice. This shift has created a welcoming habitat for all the worst creatures; Abominations, Deathweavers and numerous undead entities swarm the icy land. Dracul Armor Set: Armor forged in flame that harnesses the power of the ancient volcano that destroyed Dragon’s Heart Citadel and provides defense against even the biggest bosses. Pyrant Armor Set: Exudes a frigid aura, but provides warmth when worn, the armor set is laid out by the icy demonic presence from the depths of Blood Soul Citadel, providing a variety of stat bonuses to the wizards who are strong enough and persistent enough to acquire it. Helios Armor Set: Armor from the twin Phoenixes whose home you are invading in the Phoenix Spirit Citadel, a transcendent power that pulsates from this glorious set can defeat even the most indomitable creatures, and experience their heavenly power. Citadel: Forged With Fire is available now on Steam Early Access for $24.99 and is in development for PlayStation 4 and Xbox One.